It may not be surprising that muscle loss is common as people age, but what might be unexpected are the differences between the ways men and women lose muscle mass and that steps can be taken to mitigate the decrease and even build muscle as people age. The loss of muscle mass from age is called sarcopenia and includes the associated diminishment of muscle strength and performance. Factors, such changing hormone levels and protein needs, along with a move from an active to more sedentary routine, contribute to muscle loss as does the natural reduction of motor neurons over time, a phenomena that interferes with brain signals keyed to muscle movement. Additionally, certain types of inflammation, obesity and low Vitamin D levels have been correlated on some levels to the loss of muscle and sarcopenia, and genetics have been linked to the condition in terms of a person’s weight at birth. Authors of the 2008 report, ‘Sarcopenia: Its Assessment, Etiology, Pathogenesis, Consequences and Future Perspectives,’ found that after 50 years old, adults experience a 1 percent to 2 percent reduction of muscle mass per year, along with a 1.5 percent decrease in strength. After age 60 those losses escalate by 3 percent each year, with rates twice as high in men than women. For those that have sarcopenia, the primary consequence is the loss of muscle quality including strength and reduced muscle mass. Various factors play into the severity of sarcopenia, such as osteoarthritis or other age-related issues that can contribute to weakness and pain. As well, muscle mass can produce strength and power at variable levels and loss of muscle strength in the limbs can have outside causes with different results. It’s also likely that different types of muscle strength aren’t affected by sarcopenia at the same rate. As the condition worsens and muscle loss becomes distinct, personal functionality suffers, the degree to which depends on various factors. For instance, adults may lose some of their abilities to perform everyday tasks, adversely affecting their quality of life and personal independence. If grip strength weakens, for example, people may find it difficult to open bottles and jars or grasp door handles and handrails. Falling is a particular concern, especially for men with sarcopenia because they do so twice as often as women do with the condition. Additionally, sarcopenia contributes to fatigue and lower endurance and can lead to hospitalization, morbidity, disability and mortality. In fact, a 2014 report by the National Center for Biotechnology Information showed an estimated $18.5 billion in annual health costs has been attributed to factors associated with sarcopenia, including $10.8 billion for men and $7.7 billion in women. Sarcopenia leaves women looking less toned and therefore visibly diminished, but the condition is more widespread in men. According to the National Institutes of Health, in a 2003 study, ‘Sarcopenia in elderly men and women: the Rancho Bernardo study,’ sarcopenia affected 4 percent of men and 3 percent of women aged 70 to 75. For those aged 85 or older, 16 percent of men and 13 percent of women developed the condition. The study also found that although physical activity seemed to deter the development of sarcopenia in women, with half as many active women prone to the condition, there was no such correlation for men. 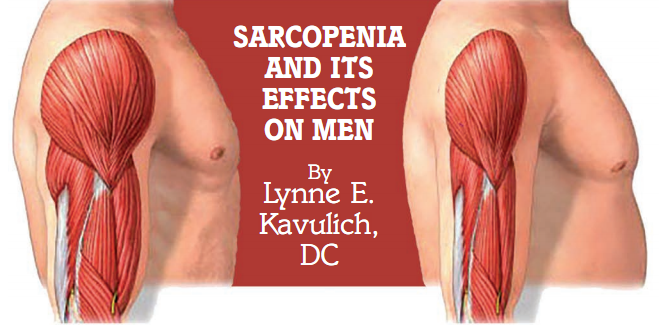 Another difference in the way sarcopenia affects men than women is how muscle is lost, with men experiencing a gradual reduction while women typically encounter the sudden loss with the onset of menopause. And, although men have more muscle mass than women do, men typically have shorter life spans and lose muscle at twice rate of women, making sarcopenia a more troubling condition for men. Because lifestyle practices can further or deter the advancement of sarcopenia, how a person lives is important. The earlier adults start practicing healthy habits, including regular aerobic and strength-based physical activities, not smoking and eating a sound diet, the better their chances will be of preventing the development of sarcopenia or mitigating its effects. Also key is that older men and women maintain protein-rich diets, since weight loss is associated with muscle loss in the elderly. Supplements containing whey protein are especially beneficial, in particular when taken immediately after resistance training exercise. A case in point is a 53-year-old Dutchess County, NY, man named Robert with borderline sarcopenia that I treated in 2012. In general, Robert was fit, but he wanted to create lean muscle mass and generally be on top of his game. He weighed 210 pounds and although he engaged in two hours of exercise a week, including aerobics, fast walking, and light weight-lifting, he had an excessive 24.9 percent body fat composition. Acceptable levels should not exceed 19.9 in his age group. His baseline state was further evaluated through a nutritional assessment, which showed a decreased ability to absorb nutrients, along with a Bioelectrical Impedance Analysis (BIA), a non-invasive procedure used to determine body composition, which, in Robert’s case was within normal limits. His body’s cell health also was examined, including a look at his cellular phase angle, the measurement of which indicates the integrity of cells, and was found to be 6.8, which is at a low level of cell integrity. I began his program with the dietary addition of a whey protein concentrate and isolate sourced from New Zealand cows, an extremely pure source. Each serving contained 20 grams of protein, which Bob consumed once or twice a day in addition a healthy dinner. I also directed him to eat at least eight servings of vegetables, daily. Robert started a customized program based on his bloodwork and clinical results, whereby all of his findings were evaluated and his program designed to personally address his deficiencies, including taking specific supplements: potassium, magnesium, Omega-3 with EPA (eicosapentaenoic acid) and DHA (docosahexaenoic acid), antioxidants based on his Bioelectrical Impedance Analysis (BIA) and cellular health levels. Due to his health and family history of diabetes, alpha lipoic acid was also recommended. I also had directed him to drink at least 64 ounces of water daily and modified his weekly exercise routine to include time on a stair climber and moderate upper body weightlifting, plus whole body vibration work with a vibration plate to boost cellular detoxification and maximize muscle cell contractions. In just four months, Robert saw impressive results. The base phase angle of his body’s cells improved substantially from 6.8 to 7.6, an optimal score indicating a strong integrity of his cells. As well, his body’s fat mass dropped by more than 7 percent to 17.8 percent, and his lean body mass increased from 75.1 percent to 82.2 percent, an ideal level. This outstanding accomplishment in a short time was made all the more notable by the fact that he lost only two pounds in body weight, meaning the reduction in his weight was accompanied by an increase of lean body mass, muscle being heavier than fat. Fortunately, medical and lifestyle approaches can help reverse sarcopenia, especially at the early stages, per the 2008 report, ‘Sarcopenia: Its Assessment, Etiology, Pathogenesis, Consequences and Future Perspectives.’ In particular, resistance exercises help build muscle mass and strength, even in the elderly. For men, another measure that’s sometimes used to combat sarcopenia is testosterone, a hormone associated with increased muscle mass and strength but naturally decreases in older men. Yet, per the above mentioned 2008 report on sarcopenia, while some studies correlate low testosterone levels in seniors with muscle loss—and it stands to reason that increasing testosterone levels would help re-build muscles. The effects of testosterone therapy on muscle strength and functioning are inconclusive. As well, although supplements of dehydroepiandrostedione (DHEA), a natural hormone that decreases with age, can increase testosterone levels, little has shown its benefit to muscle quality. Another issue is that popular research indicates synthetic testosterone prescriptions haven’t been shown to improve muscle quality in senior men and are linked with risk factors, including the development of prostate cancer and cardiovascular troubles. However, the Life Extension Foundation reports that bioidentical testosterone hasn’t been shown to have harmful effects on the prostate gland. Moreover, both men and women may benefit from bioidentical testosterone with increased muscle mass and bone density. The Foundation also found the use of growth hormone enhanced lean weight gain in adults with sarcopenia, including an average of 4.6 pounds among 220 older adults studied over a two-week period. However, the seniors also developed fluid retention, joint pain and carpal tunnel syndrome. Additionally, exercising, maintaining a nutrient-rich diet and taking nutritional supplements like whey protein and antioxidants helps heighten testosterone levels, including creatine, zinc, DHEA (dehydroepiandrosterone), tribulus (also called puncture vine), customized and branched-chain amino acids, Omega-3 fatty acids and Vitamin D, which is integral in slowing bone and muscle loss. Muscle loss is a natural part of aging, but sarcopenia isn’t inevitable. Are you seeking to have more stamina and power into your next decade? The key to preventing sarcopenia is to strive to increase lean body mass. Similar results to my client, Robert, have been duplicated regularly with others that made the decision to optimize the most important biomarker of aging, which is lean body mass. With a personalized program, focus and commitment, it’s possible to defeat sarcopenia by minimizing decreases in muscle mass, quality and function while maximizing wellness. Dr. Lynne E. Kavulich holds a Doctorate of Chiropractic and has Diplomate status by the American Academy of Anti-Aging and American Board of Clinical Nutrition. She founded American Wellness Care in 1983 and, as a specialist in non-pharmaceutical approaches to balancing hormones and brain neurotransmitters, she provides advanced, integrative care, including chiropractic, low level laser, anti-aging medicine and clinical nutrition guidance for vibrancy and mental clarity. For more information, call (845) 221-1201, visit http://AmericanWellnessCare.com or follow American Wellness Care on Facebook (https://www.facebook.com/AmericanWellnessCare).